Over the last few weeks, most of the Conor McGregor headlines we’ve seen have unfortunately been negative, as the Irish MMA star has been involved in some legal trouble outside the cage, and engaging in some nasty trash talk with his arch rival Khabib Nurmagomedov on social media. Speaking on Twitter, McGregor’s head coach John Kavanagh took us back to a simpler time, when the former champ was gearing up for a short-notice interim featherweight title fight with Chad Mendes, and world seemed to be his oyster. Conor McGregor himself provided some context for this video, chiming in with a comment on Twitter. “A spar in the lead up to the Mendes fight. Just weeks after ACL tear. Note the occasional buckle in the leg + zero kicks. The spar before this you tried to pull me from the fight. Good times! Always good, sharp work with @FransMlambo! Looking forward to his next outing!” – Conor McGregor on Twitter. At present, McGregor does not have a fight booked. While he recently announced his retirement from MMA, this retirement — as most expected — seems to have been short-lived. 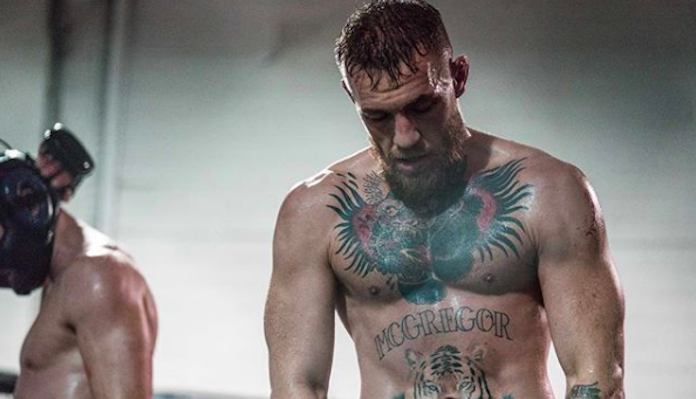 If McGregor does indeed fight again, it’s not clear who might welcome him back to the cage. That being said, rematches with Khabib Nurmagomedov and Nate Diaz both seem like options for him. What do you think of this previously unreleased sparring footage from the glorious heyday of Conor McGregor?